The mission of the Literacy Center is to assist students, grades kindergarten through 12, to improve their listening, speaking, reading, and writing skills. Funded by a generous grant from Watson and Associates, the Center offers interactive tutoring within carefully designed programs. Founded in 2004, the Watson and Associates Literacy Center is a component of the College of Education at the California State University, San Bernardino. 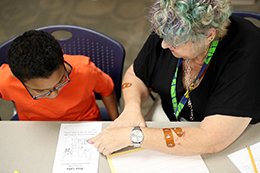 The Literacy Center provides one-to-one literacy tutoring in all four domains of literacy: listening, speaking, writing and reading to children in grades kindergarten through 12 four afternoons each week, Monday – Thursday, 3:30-4:30 pm and 4:30-5:30 pm. The tutoring sessions are one day per week for each tutee, one hour per session, and are provided for eight weeks during the fall, winter, and spring quarters of the University. The Literacy Center is designed to provide tutoring services to students who have not yet achieved grade-level proficiency in literacy, or to any student who would benefit from indiviual support to advance their skills. Tutoring services are provided by America Reads tutors and volunteer tutors who are enrolled in courses in the College. America Reads tutors successfully complete an ESEC 545 class which provides tutor training for CSUSB students to work with K-12 students to increase their skills in reading and writing. Topics include literacy methods, multicultural issues, learning disabilities and use of educational software. Tutors recieve ongoing support and coaching on best practices regularly by the reading specialists at the Literacy Center. These strategies provide instructional techniques that tutors can readily and immediately implement to increase effectiveness of the tutoring session. Pre and post online assesments document the progress of the K-12 students and tutees have increased in the acquisition and use of literacy skills and strategies over time. 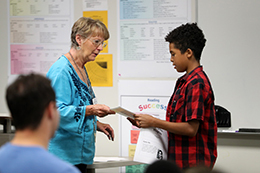 For the last week of tutoring, parents and families are invited to attend a Writing Celebration that highlights and celebrates their student's writing projects completed during tutoring.